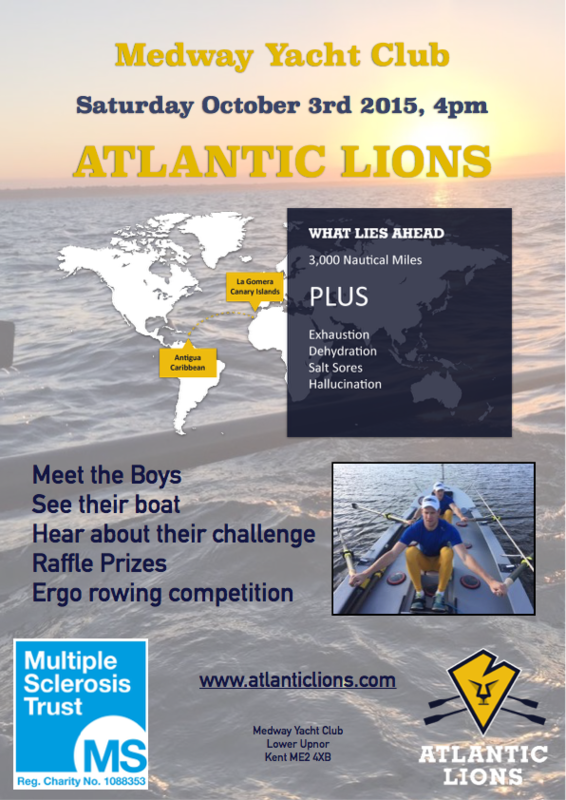 In December 2015, Matthew Townsend, a former cadet member of Medway Yacht Club, along with three of his friends, is going to row 3,000 nautical miles across the Atlantic from the Canary Islands to Antigua. They will be competing in a race (The Talisker Whisky Atlantic Challenge) along with 25 other boats and are hoping to raise £100,000 for the MS Trust while doing so. On Saturday 3rd October, from about 1600hrs, Matthew and his friends have their boat at the Club and invite all Club members and their guests to come and have a look at their boat, to talk to them about their challenge and, hopefully, to help them in some small way along the path to achieving their goal for the MS Trust. The boys, who call themselves The Atlantic Lions would like to thank Medway Yacht Club for their support in allowing them to do this. The boys will be shaking their buckets to collect money but also there will be a raffle with prizes from Craftinsure, Pirates Cave, Gillingham Marina and others, and there will be a rowing machine in the foyer of the Club where, for a small, donation, you can have a go at rowing 250 metres; prizes will be awarded to the fastest on the night. Hopefully it will be a fun and informative evening, and of course there’s the small matter of a rugby match to watch too…. More than 100,000 people in the UK have multiple sclerosis (MS). MS is a disease affecting the central nervous system (the brain and spinal cord). At present there is no cure for MS but this certainly doesn’t mean that the symptoms of MS cannot be treated. The MS Trust is dedicated to making life better for people living with multiple sclerosis by providing free information to everyone affected by MS and supporting the health professionals who work with MS. The MS Trust is in contact with 40,000 people affected by MS; that’s people with MS, their families and friends and the health care professionals who help manage MS, by providing books and information publications, newsletters and by providing an enquiry service. All of this needs to be funded.